It’s been about 5 weeks since I made my paper planner purchases. While I thought I would be able to keep two planners at once, I’ve realized that I really only use one planner – the UNCALENDAR. It has actually surprised me because it’s not as “pretty” as the Happy Planner, but the functionality of it is exactly what I needed. However, let me focus on the unpretty factor because as you can imagine, it’s visually jarring for the scrapbooking side of my brain. I have a room full of beautiful papers, washi tapes, stickers and machines that can turn any paper or sticker in to an embellishment. So I’ve taken matters in to my own hands. 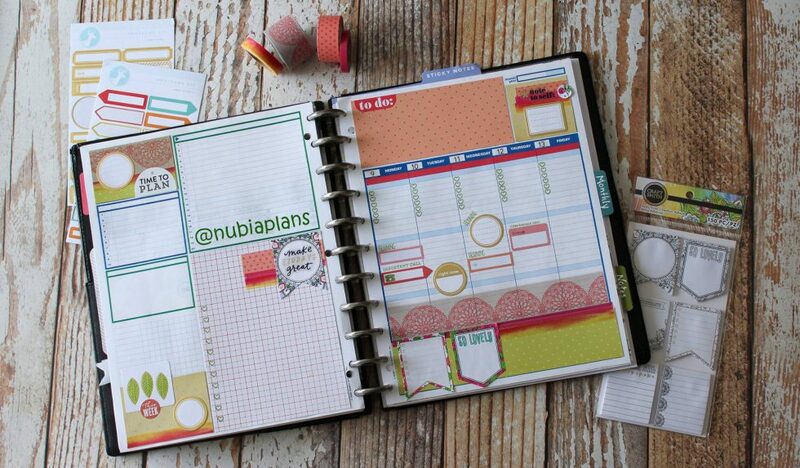 There is an entire world of planner crafty nerds like me that love to use their weekly planner as a piece of art. I’m often amazed at the weekly and monthly layouts of the many people I follow on instagram. 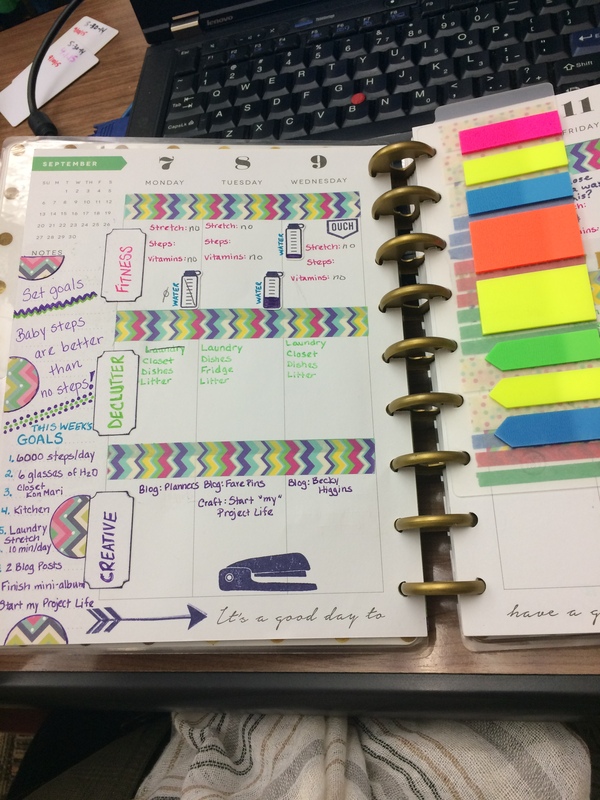 While I aspire to make my planner as fun visually because their work is absolutely stunning, I also need it to be functional for the way I think and work. But as I looked for inspiration to dress up my uncalendar, I realized that there really isn’t anyone out there that is actively dressing up their uncalendar. The uncalendar is designed to make organization simple and effective. The base colors (all primary colors) are done so intentionally as another layer to their efficiency model. I don’t need to use the color system because I’m primarily using my uncalendar for work. I’ve realized I don’t really plan my personal tasks…which will be my next step. I think I may actually create a different section to my planner that uses the uncalendar layouts for personal items, but I’m not there yet. For now, I’ve decided I need to take the lead on sharing my love for this planner and showing how I’m dressing it up. I know there are more people out there like me who like the structure that the uncalendar can provide but want the pretty factor. I’m no expert in layouts, but I feel like I’m getting more fearless and having fun with the arsenal of crafty supplies I own. My layouts are getting more creative and more visually appealing as the weeks go on. I’ll be posting my layouts on my instagram and pinterest accounts each week, but figured it would help to at least give you an idea of what the original layout looks like. If you’ve known me since I was kid, then you know I’ve always kept some sort of notebook/planner. 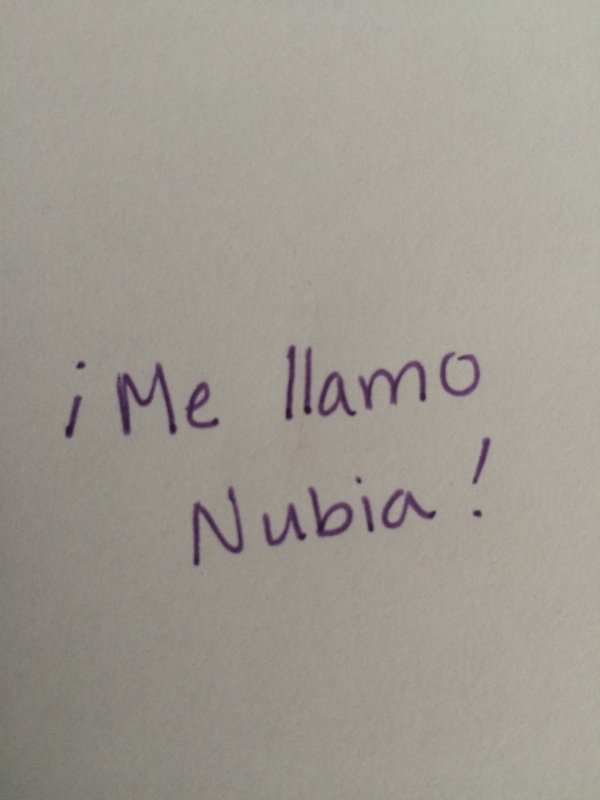 I was always jotting down favorite quotes, tasks or coursework notes. If you went to school with me, you know I HAD to take notes and I ALWAYS used different colored pens to highlight different aspects of the subject matter. If I made a mistake, white-out was my best friend. If I didn’t have white out, I often rewrote the entire page. I needed it to feel clean and pretty. Reflecting back, it seems silly, but I know that the rewriting and art of making my notes pretty was my way of ingraining the information to memory. It is how I learn as a visual learner. 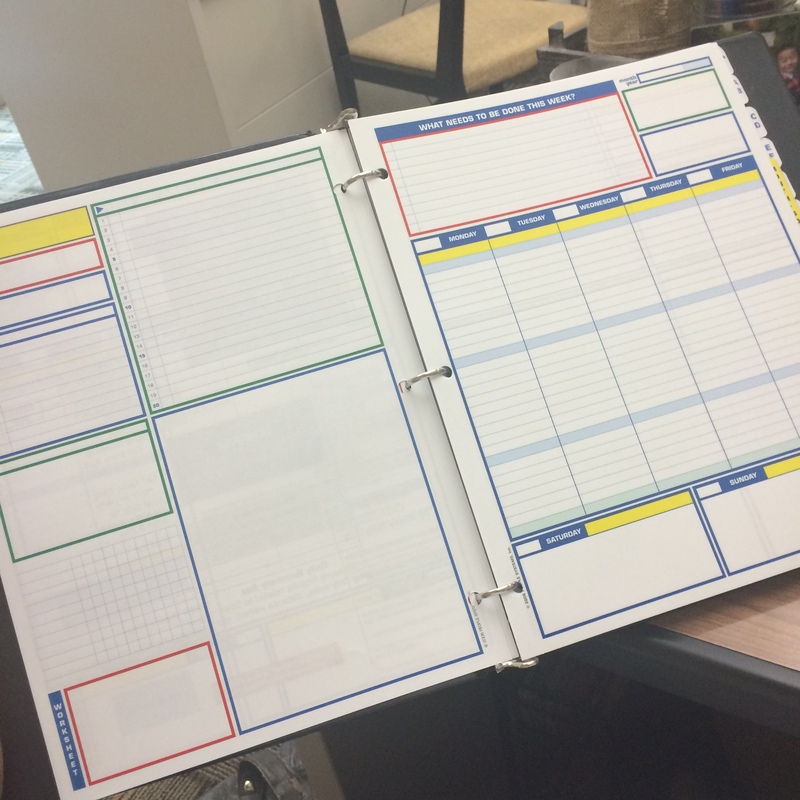 Enter my workforce era –> you’ll still catch me with a notebook or list pad! You can imagine my glee when I saw that paper planners were making a comeback. Now I could keep appointments and my to do lists in one place. Best. News. Ever! However, my need for it to look pretty is still totally there, so I had to find a solution. I needed my notes/lists to be in color to separate projects, but I didn’t want to be that girl that walks around with colored pencils. So I was on a hunt for the right writing utensil. As a scrapbooker, I have all kinds of pens and none were just right. I love the find point of the Staedtler pens, but they are permanent. I use them all the time for my crafting projects, but if I make a mistake, it’s easy to try again with my arsenal of supplies. I’ve tried using them in my planner, but it drives me crazy having to scratch out a mistake. For my at home planner, I have a lot of predetermined boxes and subject areas, so I have no problem using the Staedtler pens then. 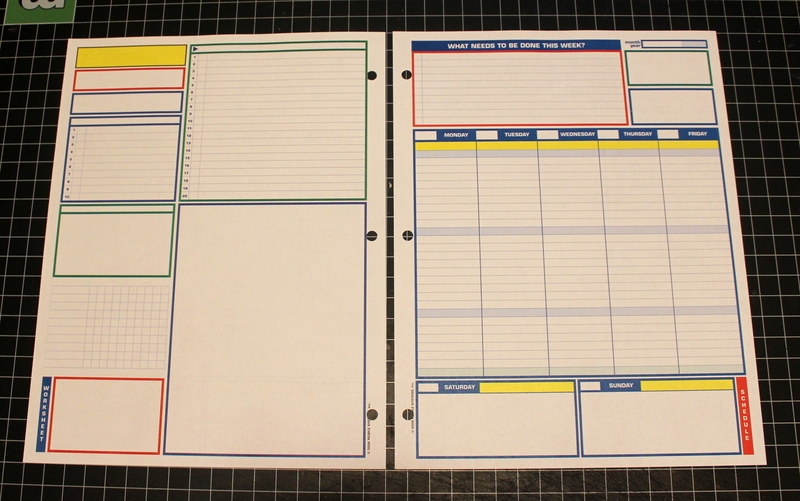 I have more difficulty in using them for non-planned items (like jotting down to do lists). In February, I saw a pic on Instagram a fellow crafter who uses the Pilot Frixion erasble markers for projects. ERASABLE marker? What?! I immediately looked them up…there are plenty of crafters who showcase them in youtube videos. I was instantly mesmermized. Imagine my sheer joy when I discovered they also made erasable gel ink pens! Now…we all have terrible memories of the erasable pens from our youth, so I was a bit skeptical. I did some homework and saw that Staples and Target sometimes carried these pens, so I was a mission to get myself a set to try out. I picked up a 3 color set and immediately knew that these were perfect for me. So of course, I bought the 24 pack via amazon (I don’t think a US based company sells these pens yet as my packaging was in Japanese – I think). I now carry them around in a pencil case in my purse, and I pull out a few at time in meetings. If people watch me erase my notes, I immediately get questions or it gets grabbed out of my hand to examine closely. It’s always pretty funny. 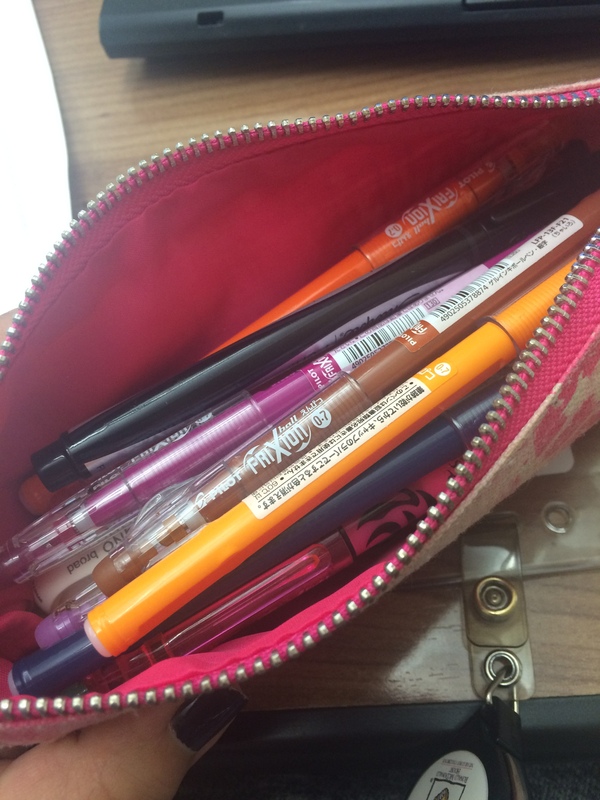 My “pencil” case that carries my Pilot Frixion Erasable Gel Ink Pens. I also have a Frixion erasable highlighter and the SIgno White Pen (for when I need to write on dark paper) and black fine tip Sharpie. I think I’ve even been the reason that 3-4 of my colleagues have purchased their own sets since I got my set. They are amazing and great for us paper planner folks! Below is a photo sample of fixing a mistake. 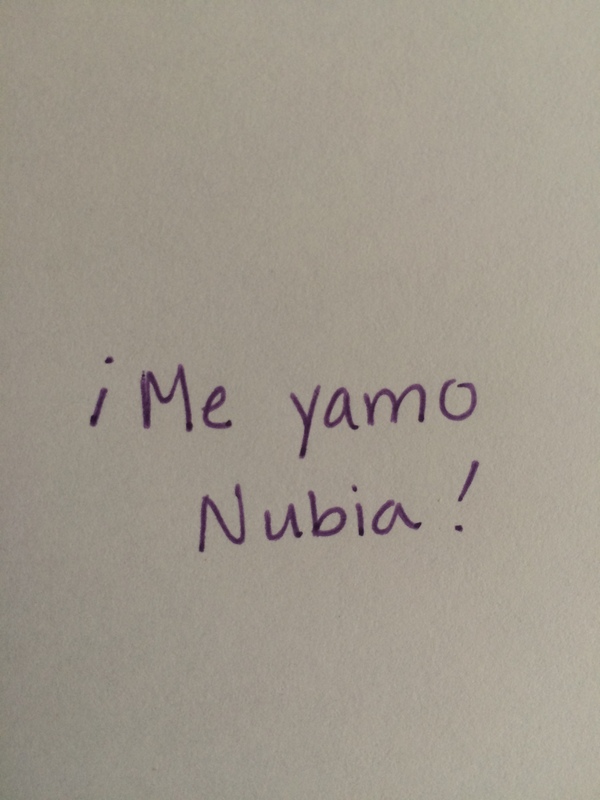 This is me forgetting my Spanish. Caught my mistake and erased the wrong letters. Clearly there are still faint marks of the dark ink but it’s minimal. 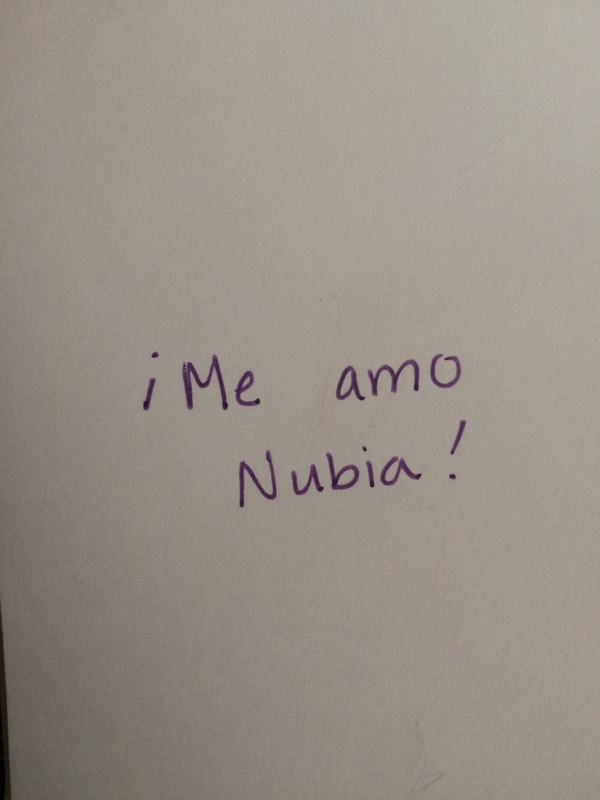 Spanish is back on track! 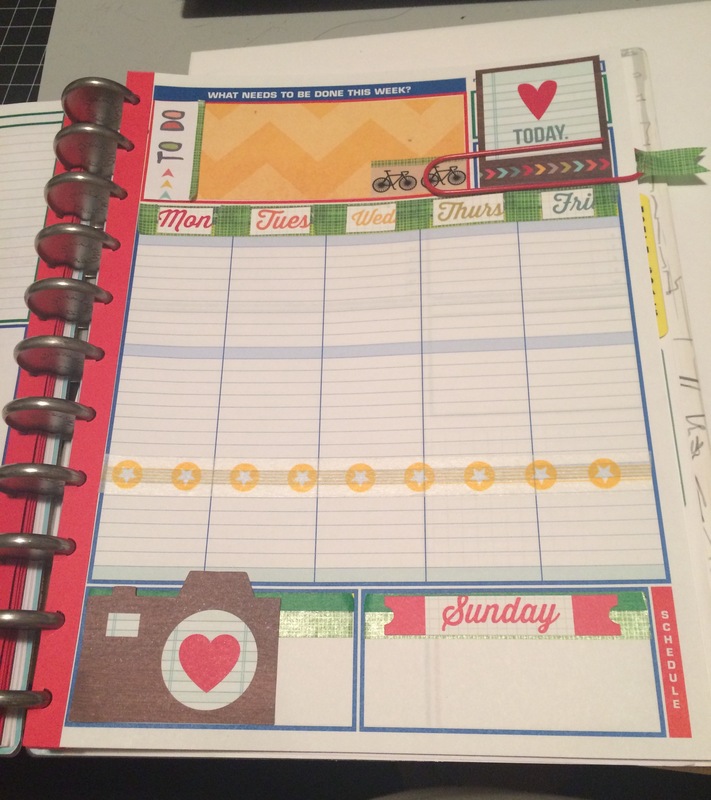 I recently noticed a trend both in the crafting community and in my younger colleagues…the paper planner is making a comeback. For a visual learner like myself, this was very exciting. I was most excited by how I saw my crafty friends transform their planners in to beautiful pieces of art. So I absolutely wanted in on the fun. What made me do a screeching halt…the COST of some of these planners. I just couldn’t wrap my head around paying that much for paper! Yes, as a scrapbooker I realized that this is the most hypocritical statement I could ever make! Well lo and behold, Me & My Big Ideas had a very reasonably priced planner called the Happy Planner (about half the cost of some of the high end planners I was eyeing). It wasn’t just functional, it was also super cute and had all these embellishments I could buy. It ALSO came on my favorite type of binding – the disc system. If you know nothing about disc bound notebooks, be prepared to have your worlds rocked. I first heard about the disc bound system from teacher friends. Levenger was probably one of the first companies I had discovered that had this system. But like the Franklin Coveys of the world, I simply couldn’t justify that price when I was in graduate school (a LONG LONG time ago). Don’t get me wrong – their stuff is gorgeous! I just couldn’t justify the expense when I was trying pay off my debt. Enter one of my hundreds of trips to a Staples store. I’m a girl that loves her office supplies, so I can roam a Staples as if it was my craft stores. I’ll look at the many pens, post its, etc. Well, can you imagine my shock to discover that they had a disc system too? it’s called Arc and it’s the more reasonably priced version of the Levenger system so of course I had to have it. Up until this summer, I had been using my Passion Planner. 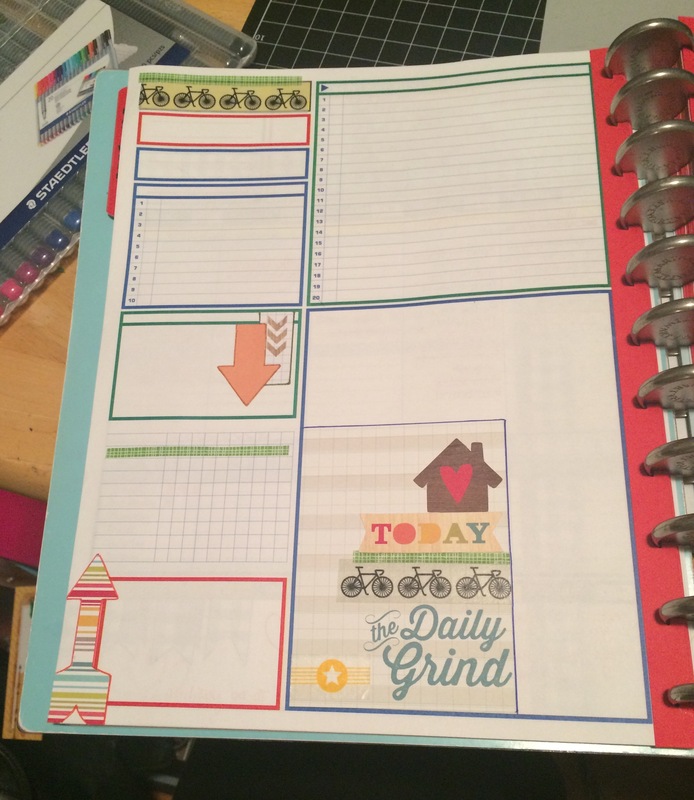 I love the planning, goal setting and reflection of the planner but I quickly realized that I did not need the time slots. I keep my appointments on my phone and outlook so there was an entire chunk of the planner that I wasn’t using at all. What I needed was a place to write to-do lists per day. The Happy Planner seemed to be more of what I was looking for so i purchased it! The day that it was scheduled to arrive, I boldly proclaimed my love of planners on facebook only to be immediately schooled by the very same teacher friend that told me about the Disc system. She told me about the revolutionary planner called The Uncalendar – it gave her the space to lay out her week and to jot down multiple lists in one space. Multiple lists? What?! I immediately looked it up and realized that this layout was exactly what I needed for work! So even though I was literally waiting for one planner, I ordered a SECOND! Let’s all chuckle together….these two planners together equal the cost of one the more high end planners I was considering. OF COURSE they are, right? But what has happened is this…I think I have found the perfect work planner (which is where I needed it most) while also now having a fun calendar for my goals. Logically, I have to decorate both with my arsenal of supplies! So here’s a few sneak peeks. I need to take some better pictures later, but these pics will give you a general idea of how I’ve made them both work for me (for now). I tend to post more on my instagram if you want to see other potential layouts. Maybe my perfect planner combines both, but maybe I’ll whittle down to one eventually. For now, I’m enjoying the creative process of jazzing up the very serious task of scheduling out my week. My Happy Planner – I’ve eliminated the Morning, Afternoon and Evening sections and instead converted them into my goal sections. Each area has tasks or journalling. Despite all the cuteness, I wasn’t very good about accomplishing my tasks or documenting my progress this week. Next week will be better! The blank Uncalendar was a little too bold and intimidating for me at first glance. The primary colors serve an organizing purpose that I choose not to use so I needed to diffuse the intensity of the overall look. The Uncalendar’s weekly layout jazzed up a bit. There are no dates and there are lines for task jotting! Since I only use this for work, the weekend boxes along the bottom tend to become areas of creative experimental fun. My favorite part of the Uncalendar is the block page. Look at all those different blocks?! Those turn in to different targeted lists for projects or departmental work (I oversee two plus have special projects). I looooooooooooooove this aspect of the planner.